Today I'm wrapping up my Birding Road Trip with a couple of stops. Sebastian Inlet State Park and back to Backbone Road near Lake Wales. Sebastian Inlet had been hosting a Glaucous Gull, another rare visitor to Florida. And as I was pulling into a parking spot at Sebastian the Gull could be seen just a few feet away. Way easy..
And the Northern Gannets I missed yesterday were seen today just off the beach. Other birds spotted here included Great Black-backed Gulls, Herring Gulls, Laughing Gulls, Forster's Terns, Black Skimmers, Brown and American White Pelicans, Red-breasted Mergansers, Snowy Herons, White Ibis and Ruddy Turnstones. Lastly, another attempt to see the pair of Whooping Cranes in the cattle pastures along Backbone Road near Lake Wales. This time they were out in the open but rather far off. Disappointing for photography, but good to get to see them. Future observations of these birds are going to be iffy as the program to re-introduce the species as a viable, non-migratory population in Florida has been discontinued. Black-bellied Whistling-Duck, Fulvous Whistling-Duck, Snow Goose, Ross's Goose, Canada Goose, Muscovy Duck, Wood Duck, Blue-winged Teal, Northern Shoveler, American Wigeon, Mallard, Mottled Duck, Northern Pintail, Green-winged Teal, Canvasback, Redhead, Ring-necked Duck, Greater Scaup, Lesser Scaup, Bufflehead, Common Goldeneye, Hooded Merganser, Red-breasted Merganser, Ruddy Duck, Common Loon, Pied-billed Grebe, Horned Grebe, Wood Stork, Northern Gannet, Double-crested Cormorant, Anhinga, American White Pelican, Brown Pelican, American Bittern, Great Blue Heron, Great Egret, Snowy Egret, Little Blue Heron, Tricolored Heron, Reddish Egret, Cattle Egret, Green Heron, Black-crowned Night-Heron, Yellow-crowned Night-Heron, White Ibis, Glossy Ibis, White-faced Ibis, Roseate Spoonbill, Black Vulture, Turkey Vulture, Osprey, Snail Kite, Northern Harrier, Cooper's Hawk, Bald Eagle, Red-shouldered Hawk, Red-tailed Hawk, Sora, Purple Gallinule, Common Gallinule, American Coot, Limpkin, Sandhill Crane, Whooping Crane, American Oystercatcher, Black-bellied Plover, Semipalmated Plover, Killdeer, Ruddy Turnstone, Ruff, Stilt Sandpiper, Sanderling, Dunlin, Least Sandpiper, Long-billed Dowitcher, Wilson's Snipe, Greater Yellowlegs, Willet, Lesser Yellowlegs, Pomarine/Parasitic Jaeger, Laughing Gull, Ring-billed Gull, Herring Gull, Glaucous Gull, Great Black-backed Gull, Forster's Tern, Royal Tern, Sandwich Tern, Black Skimmer, Rock Pigeon, Eurasian Collared-Dove, Common Ground-Dove, Mourning Dove, Barred Owl, Belted Kingfisher, Red-headed Woodpecker, Red-bellied Woodpecker, Yellow-bellied Sapsucker, Downy Woodpecker, Northern Flicker, Pileated Woodpecker, American Kestrel, Merlin, Eastern Phoebe, Vermilion Flycatcher, Ash-throated Flycatcher, Loggerhead Shrike, White-eyed Vireo, Blue-headed Vireo, Blue Jay, American Crow, Fish Crow, Tree Swallow, Carolina Chickadee, Tufted Titmouse, Brown-headed Nuthatch, House Wren, Winter Wren, Sedge Wren, Carolina Wren, Blue-gray Gnatcatcher, Golden-crowned Kinglet, Ruby-crowned Kinglet, Hermit Thrush, American Robin, Gray Catbird, Northern Mockingbird, Sprague's Pipit, Cedar Waxwing, Black-and-white Warbler, Orange-crowned Warbler, Common Yellowthroat, Palm Warbler, Yellow-rumped Warbler, Chipping Sparrow, White-crowned Sparrow, White-throated Sparrow, Savannah Sparrow, Swamp Sparrow, Eastern Towhee, Northern Cardinal, Eastern Meadowlark, Red-winged Blackbird, Rusty Blackbird, Common Grackle, Boat-tailed Grackle and House Sparrow. Headed east, today, toward the Atlantic Ocean at Flagler Beach for some sea watching. On past winter visits here, hundreds of Northern Gannets could be observed from shore. Today's weather conditions included clear skies, but was chilly with a strong brisk wind causing a very heavy surf. And there were no gannets. Made several stops between the Flagler Beach Pier and Gamble Rogers State Park along Highway 1A1. One observation at the Gamble Rogers over look was a distant Jaeger. To far out to definitively say if it was a parasite or a pomarine jaeger. Leaning toward Pomarine. My original plans included a stop at Lust Road at lake Apopka North Shore Mitigation Area. and perhaps some hiking within the property. The North Shore Mitigation Area is managed by the St Johns River Water Management District. The SJRWMD recently has opened an 11 mile Wildlife Drive which is only open to the public on week ends and federal holidays. But today was a federal holiday so I was able to include entering and enjoying the Wildlife Drive. At the Lust Road Gate two, rare in Florida, species have been wintering. A long-tailed duck has been using a water reclamation pond and an Ash-throated Flycatcher has been active in the area. Got the flycatcher but dipped on the duck. I don't think anyone reported the long-tailed duck today. Lots of good birds today along the drive. Soras, Purple Gallinules, a beautiful male Vermilion Flycatcher, a Horned Grebe, lots of Pied-billed Grebes, Fulvious Whistling Ducks, Ruddy Ducks, Ring-necked Ducks, Blue-winged Teal, Northern Shovelers, Northern Pintails, American Bitterns, herons and egrets, Red-shouldered Hawks, Ospreys and Northern Harrier. Managed to add one more venue before dark with a quick visit to Merritt Island NWR. Only had time to visit Blackpoint Drive and found many Blue-winged Teal, Northern Shovelers, American Wigeons, Coots, Hooded Mergansers, Northern Pintails Pied-billed Grebes and Roseate Spoonbills. Also added a Greater Yellowlegs, Semipalmated Plovers, a Merlin, Reddish Egrets, Glossy Ibis, White Ibis and Tree Swallows. Another cold day in the Panhandle and today I'm joining with Dave and Tammy McQuade with stops at the Apalachicola Airport and Florida Caverns State Park. But first was one more look at activity at the Biltmore Avenue Ponds. The purpose for going to the Apalachicola Airport, is that there are a few Sprague's Pipits that will winter at this location. This is a western bird and a rare find east of the Mississippi River. Especially rare in Florida. The birds seen here live in the grass bordering the airport runways. So after we received permission from the airport staff, who provided us with orange safety vests and radios, Dave, Tammy and I walked the property. Most of it had been recently mowed but a productive section that hadn't been mowed yet did yield a lone pipit. Its a small bird with a unique flight pattern when flushed and a distinctive call. We couldn't relocate it for any possible photo opportunities. Our friend Eary Warren was successful with getting pics of the pipit a couple of weeks ago. Other birds seen here include Eastern Meadowlarks, Killdeer, Savannah and Vesper Sparrows. Next venue today was Florida Caverns State Park, near Marianna, Florida. Someday I'll take the time for the cavern tour, but we are here because of a few uncommon in Florida birds. Winter Wrens are fairly reliable here and we did locate two of them in the area of the Chipola River canoe launch site. Its a cold and windy Saturday morning in the Panhandle. Yesterday I had birded in Gainesville and in Tallahassee, today I had arrived at St Marks National Wildlife Refuge. For birders, visiting St Marks, especially in the winter months, can be a lot of fun. Many wintering species seen here can be quite uncommon to rare in southern Florida. In preparing for this visit, I had spent a lot of time reviewing ebird reports from this venue. A couple of interesting species being reported had disappeared before we got there. A brewers blackbird that had been an easy pick in the lighthouse parking area and a beautiful, male vermilion flycatcher that had also been a easy pick up at Stoney Bayou impoundment. The flycatcher had returned to this spot for at least three years, Saw it on my last visit. But it disappeared a few weeks ago. Lots of good birds are still on hand though. Some targets today included Rusty Blackbirds, American Black Ducks, Clapper Rail, Virginia Rail, White-faced Ibis, Common Goldeneye, Nelsons Sparrow and more. Didn't get all of them, but did, finally, was successful with locating Rusty Blackbirds. A fellow named Don Morrow was nice enough to share the location of a flock at the double bridges. A good start. Further on, along Lighthouse Road, stopped at Stoney Bayou. Lots of birds but so many were staying on the far shore in an effort to get out of the cold wind blowing across the water. Suspected and later confirmed at least one White-faced Ibis was on hand, plus White Ibis, Greater Egret, Snowy Egret, Coots, Buffleheads, Scaups, Great Blue Heron, Little Blue Heron. Next stop was at the headquarters and picnic ponds area. Lots of American Wigeons, Ring-necked Ducks, Mallards, Rudy Duck, Coots, Pintails, Redheads, Black-crowned Night-herons and a lone Yellow-crowned Night-heron. Missed on the American Black Ducks and the reported Eared Grebe wasn't seen today. Dave and Tammy caught-up with me at this point. They had stopped at the Biltmore Avenue Pond first today for another try for the Ross's Geese. 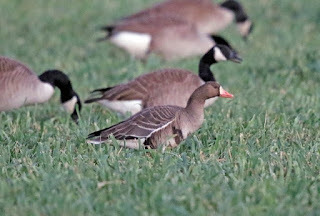 No Ross's, but did relocate the Greater White-fronted Goose. We moved onto the Lighthouse. Lots of ducks - American Wigeons, Canvasbacks, Redheads, Lesser and Greater Scaup, Ruddy Duck, Common Goldeneye, Red-breasted Merganser, Common Loon, Cormorants, American Oystercatchers, Buffleheads, Blue-winged Teal, Northern Shovelers. Spent a few more hours enjoying the refuge. We checked the helipad area for red-cockaded woodpeckers and henslow's sparrows. Dipped on these, but added Ruby-crowned Kinglets, Swamp Sparrow, Sedge Wren, House Wren, Bald Eagle and Brown-headed Nuthatch. We get a few Snow Geese wintering in Florida every year, but the Ross's Goose is quite uncommon. Several have been reported at the Biltmore Avenue - North Pond in southeastern Tallahassee. A couple of years ago, Bob Pelkey and I had visited the venue to look for the Whooping Crane that had been wintering there over several years. 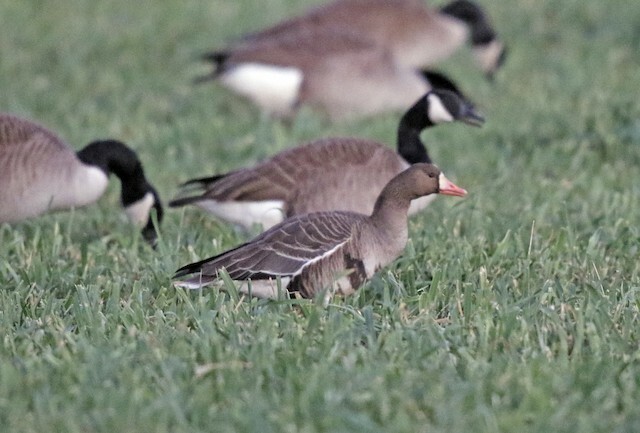 The crane hasn't been around lately,( last reported in Feb 2016 ) but Snow Geese, Canada Geese, the Ross's Geese and a lone Greater White-fronted Goose have been using the site lately. So, on this road trip it was onto the Biltmore Avenue hotspot on Friday afternoon after leaving Gainesville. Luckily the Snow Geese and the Ross's Geese were on the pond in a fenced in pasture when I arrived, no other waterfowl were present though. Didn't really get a chance for much photography on the geese. Because the cows kept blocking the view. The geese all flew off. Why? Because a DRONE was hovering over the pond. Not the first time this has happened to me. The Ross's Geese haven't been reported from Tallahassee since. David and Tammy tried on three different visits to the venue without success. They got the Greater White-fronted Goose, which I dipped on. One last stop before nightfall. Lake Henrietta Park is close by and occasionally rusty blackbirds can be found there. Walked the path around the lake and spotted lots of good birds we may not see in Ft Myers. Like a White-throated Sparrow, Cedar Waxwings, Ruby-crowned Kinglets, my FOS Redheads and Canvasback. Other birds included Barred Owl, Lesser Scaup, Rudy Duck, Wood Duck, Buffleheads, Yellow-bellied Sapsuckers, Limpkin and American Robins. No rusty blackbirds today. Tomorrow I'll be birding at St Marks NWR with the McQuades. Friday the 12th was a very long day with stops in Gainesville and Tallahassee. Friends, David and Tammy McQuade had birded several of these locations just the day before and offered timely intel. At daybreak, I was on the Hawthorne Trail near Payne's Prairie in Alachua County, were I had Chipping Sparrows, Eastern Towhee, Ruby-crowned Kinglets, Tufted Titmouse, American Robins and Carolina Chickadee. A female Ruff, or Reeve, is a rare visitor to the United States. Sweetwater Wetlands Park was a very special venue in Gainesville. Purple Gallinules, Wilson's Snipes, American Bitterns, Soras, Long-billed Dowitchers and a very rare Ruff were all easily observed and photographed. Plenty of waterfowl including Buffleheads, Black-bellied Whistling Ducks, Ruddy Duck Blue-winged and Green-winged Teal, Mottled Ducks, Northern Shovelers, Lesser Scaup, Common Gallinules, American Coots, Pied-billed Grebe and a Horned Grebe. Other birds seen included Least Sandpipers, a Roseate Spoonbill, Limpkins, Cooper's Hawk, Savannah Sparrows, Red winged Blackbirds, Tree Swallows, Killdeers and all the expected waders. Another interesting sighting were wild Cracker Horses that are a part of the free-range Payne's Prairie herd. Instead of a visit to the La Chua Trail at Payne's Prairie State Park, I had switched to a new venue recommended by David and Tammy McQuade. They had a great sparrow experience on Thursday. Lincoln's, Grasshopper, White-crowned, Vesper, Savannah, and Swamp Sparrows, plus a Golden-crowned Kinglet. I didn't do as well as Dave and Tammy, but did add Savannah, White-crowned and Swamp Sparrows. Had to move along as the expected rain had arrived. So onto Tallahassee.